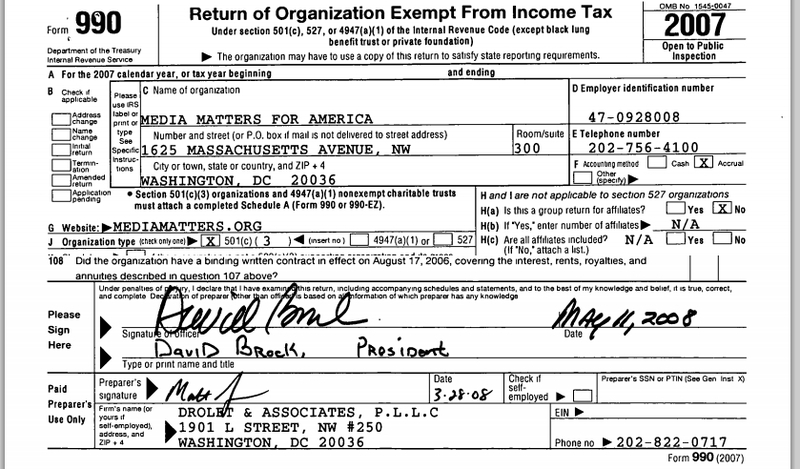 For some reason Andrew Breitbart, Mike Flynn, and Dana Loesch, from the propagandist Big websites, descended upon the Media Matters for America headquarters in Washington DC to request the non-profit's tax filings. Apparently, the latest right-wing meme regarding Media Matters is that they are not disclosing current tax information and are skirting the law. The three conservative activists decided to film their journey to try and prove a point but were unfortunately thwarted when Media Matters complied with their request. 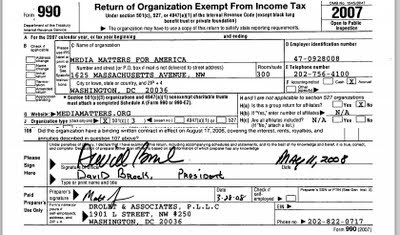 Unlike other tax-exempt organizations that make their latest IRS filings easily available at their own websites (such as the Media Research Center, for example), MMFA apparently wants the public to find that information for itself. Since the most recent available IRS 990 filing from MMFA covers 2009, we decided to see if they had any more recent information to provide us. By sheer chance, we happened to walk into the building as MMFA head honcho David Brock was walking in. He looked very uncomfortable. But he kindly sent a couple of goons–who by this time had brought their own video camera–to deliver a sheaf of papers. Sadly, it was just MMFA’s IRS 990 filing for 2009 all over again. Apparently, Big Journalism was not only mad that Media Matters doesn't post their filings on their website even though they admit in their article that you can find it for free from websites such as GuideStar, they were also mad that they didn't get the most "recent" filing - Media Matters handed them the same 2009 Form 990 that can be found online. If you watch the video on the Big Journalism post, it would appear that Media Matters was attempting to stonewall Breitbart's crew but if you watch the video Media Matters took of the event, you clearly hear them tell Breitbart that their next filing won't be until November. You see, Breitbart wants to make Media Matters look bad by confusing the public over the details regarding their filings. By complaining that Media Matter's last IRS filing was from 2009 gives the appearance that Media Matters hasn't reported their financials to the government for over two years but if you consider IRS requirements regarding when to file, which requires the organization to "file Form 990 by the 15th day of the 5th month after the organization’s accounting period ends (May 15th for a calendar-year filer)," then it would appear Media Matters is within the law. The last three years of filings tell a lot that Big Journalism doesn't. 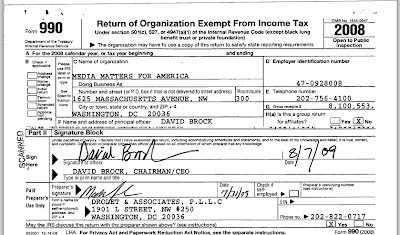 The 2007 form was signed by David Brock in May of 2008, 2008's form in August of 2009, and the 2009 form in November of 2010. 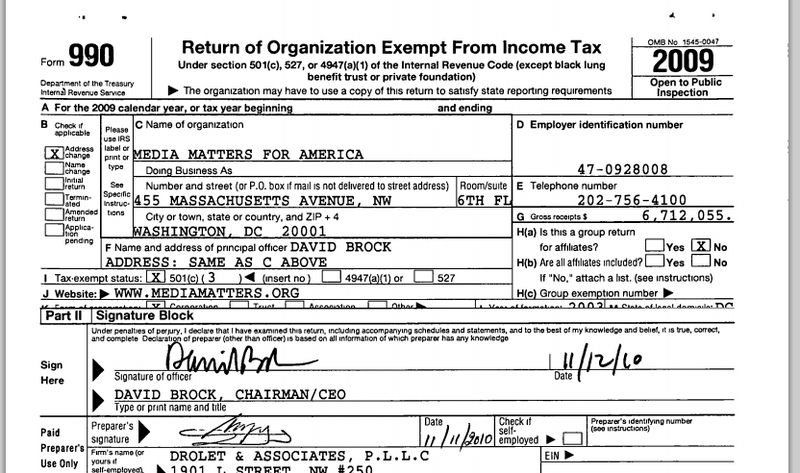 Below are screenshots of the top of the form indicating the year and the signature of Brock, Media Matter's chairman and CEO. 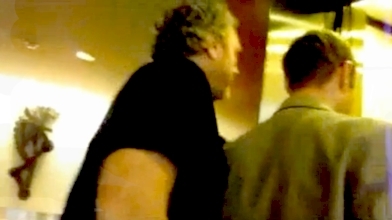 Big Journalism had gone on in their blog post to cry about "goons" trying to prevent them from filming David Brock but if you pay attention to the Big Journalism video, it appears Breitbart and his cohorts attempted to walk through the lobby and go all the way up but were stopped. The video shot by Breitbart shows two separate incidents - one from earlier in the day and one from later in the day. Anyone knows that in today's day and age you cannot enter a private building freely. Breitbart appeared to shove his way onto the lobby elevator but apparently didn't go up being that there is no video of him in the offices of Media Matters. Comparing both videos, it is obvious that Breitbart attempted to waltz into the Media Matters headquarters and start bellowing for answers but was stopped by these so called "goons." 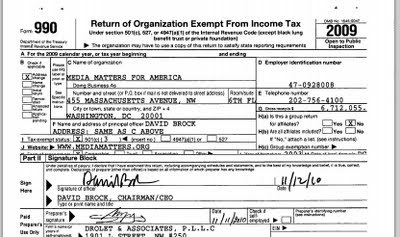 Breitbart admits that during their second visit to the organization, Media Matters provided them with copies of their most recent IRS filings that could be obtained free over the internet. This was handed over to them in the lobby. 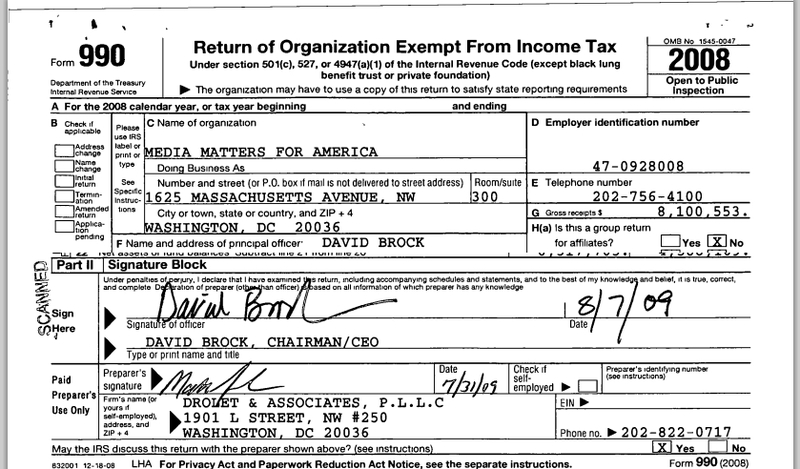 So the conclusion to all this is that Andrew Breitbart and the Big team do not understand, or choose not to understand, tax filings and intended to mislead the public as to the financial status of Media Matters. This is all part of an orchestrated attack from the right against the media fact-checking organization that has been very critical of the information these activists masquerade as news.